Lucy and I have been very sorry to hear from our friend P. J. Lawrence, Bishop of Nandyal, of serious flooding in Kurnool. About 25,000 people are said to be trapped in the city, amidst 10 foot floodwaters. Basic relief plans are starting up, It was delightful and moving and to visit the city in 2008. We were bowled over by the love and generosity of so many people we met, and very impressed by the vigorous work going on to build the Church, both people and buildings. There had been serious foods in 2007, but this seems even worse. 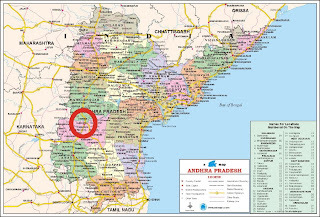 In Nandyal Diocese several areas are drowned in floods by the inflow of the rivers Thungabadra and Krishna. Mostly the Kurnool town is almost all drowned and other villiages in Kurnool District also submerged in water. Particularly our great church in Kurnool town also been surrounded by flood waters more than ten feet. Our clergy and the congregation members living in the surrounding area of the church are taking shelter in the balcony of the Church. And the news is that the situation may worsen further. People are running to higher grounds, and are trying for help. There is a sense of helplessness and uncertanity of life with the sense of drowning. We have just concluded the meeting of all the leaders of the diocese to prepare for relief work with supply of food, water and shelter in our schools hostels and church buildings. We also conducting prayers of intercession and help for the gratest distaster. The situation is grave with raising level of water of rivers canals and tanks. This is the first of its kind we are appealing for your prayers. On the part of the Diocese priests, church workers, volunnteers and the whole diocese on the war footing for conducting relief and counselling and spiritual services. So, please, pray, and when the time comes for help with reconstruction, please be generous. This isn’t a well-known part of the world, and I hope people in our diocese, especially those involved in our schools link, will be characteristically imaginative and generous in the face of this need.